I love Fall, but it can be bittersweet if you are a gardener. I am not a gardener, but my mother is one of the extraordinary sort. Her lawn is always impeccable and her flower beds are award-winning (no kidding!). Lately she's been hard at work pulling up annuals and cleaning out the remnants of her vegetable garden. While I was assembling this dessert, it occurred to me that this might be something she would want to make in the colder months, when she's lonely for gardening. 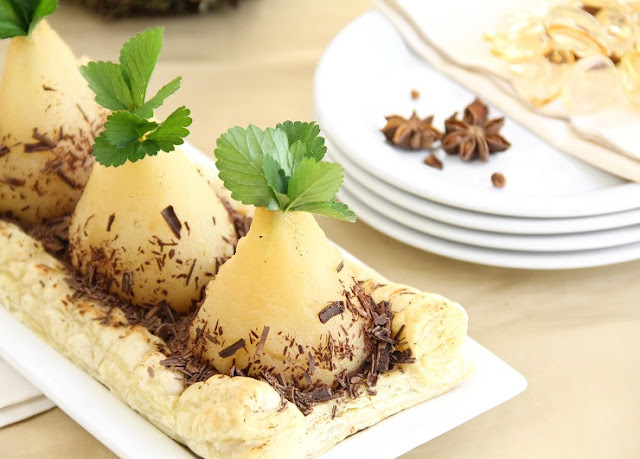 Small pears remind me of flower bulbs, and here they are poached and "planted" on ready-made puff pastry. Once baked and cooled, they are sprinkled with"soil" (chocolate shavings), and a sprig of mint on top gives the effect of emerging leaves. 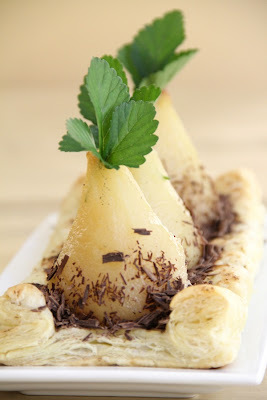 My last pear and puff pastry creation was easy to make, but this might be even easier! I firmly believe that anyone can make this... and should. 1. Fill a medium saucepan with 2 quarts of water. 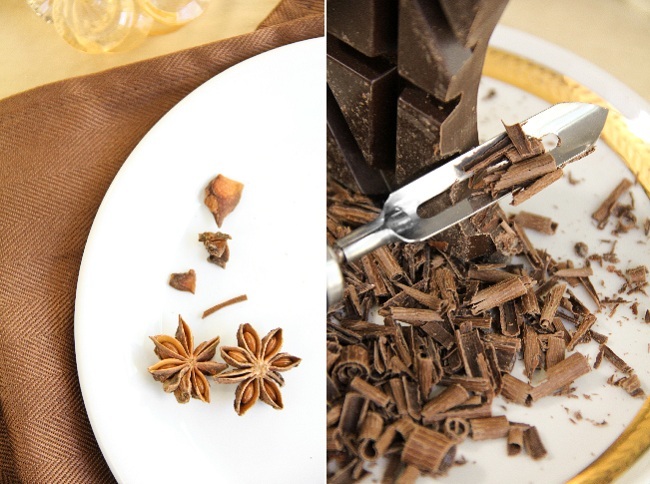 Squeeze lemon into the water, then add sugar, vanilla beans, star anise and cinnamon sticks. Add the squeezed lemon rind also. 2. Bring to a simmer over medium-high heat. When sugar has dissolved, add pears. 3. Simmer peeled pears for 25 minutes. Remove from heat and place pears on a plate to drain. 1. Line a cookie sheet with parchment, set aside. Preheat oven to 425 degrees. 2. 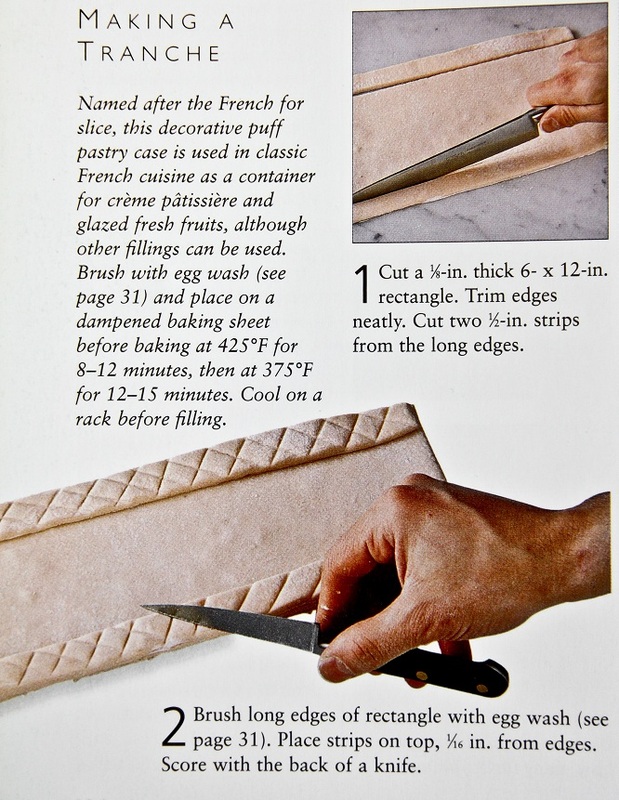 Allow puff pastry to thaw according to directions. Roll puff pastry slightly thinner with a rolling pin. Transfer to baking sheet and coat with egg wash.
4. Score the edges with the back of a knife, creating a quilted pattern. 5. Bake for 18-20 minutes at 425 degrees, or until puff pastry is golden. 1. When pastry is cool, sprinkle chocolate shavings around the base of the pears and into the tranche. 2. Insert 1 sprig of mint into the tops of the poached pears where the stem would be. 3. To divide into servings, cut puff pastry between pears. Serve with a knife and fork. Note: I did not core my pears, but you may choose to do so. This just looks so elegant. This is amazing! What an awesome idea, and it looks so yummy! Wow, so pretty! Gorgeous photos...it really does look like planting bulbs! Very cute! a great dessert for dining at a gardening enthusiast's! Beautifully written and photographed post. Those pears look so proud sitting in their little pastry bed. Beautiful.... and yet I believe must be real delicious too! so, so, so gorgeous. i wish i lived in your house! That is a really pretty tart and unusual way of decorating it! I really love that seasonal creation. Absolutely lovely - pears and chocolate are getting a lot of love lately, and I am all aboard that train. It's a delicious, classic yet oft-forgotten marriage. This has got to be the cutest thing I've ever seen! Yum! This is so tasty looking! Beautiful photos! This is so cool..and looks delish too!! So pretty! And they totally do look like bulbs. 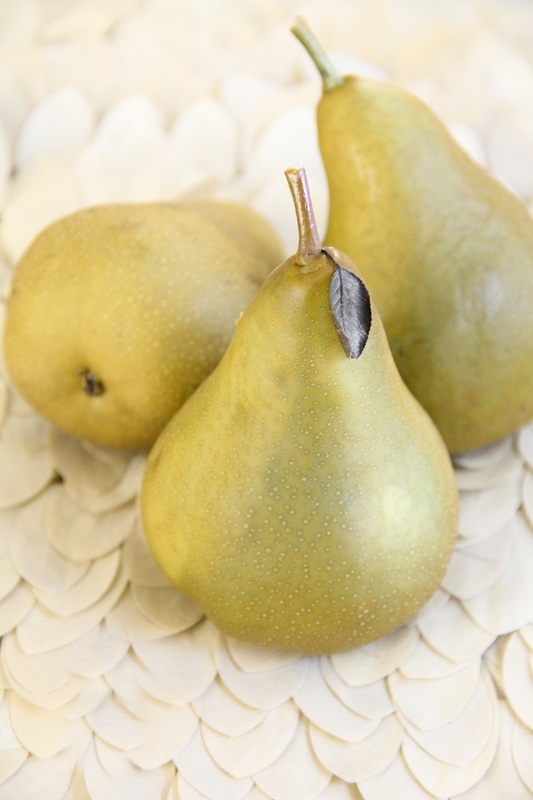 I've never poached pears, but both of your pear posts are making me realize more and more how much I have to do it. I love poached pears and the tranche is too adorable with its decorative pattern. Now I have to find out if any of the stores around here carry all-butter puff pastry! so pretty & elegant! i love the pictures! Very festive looking! Love it. Love the simple elegance and thanks for the tutorial on the Tranche. Hope your mom enjoys this dessert and the fall. Beautiful presentation!! I am sure it is tasty! This looks so delicious! 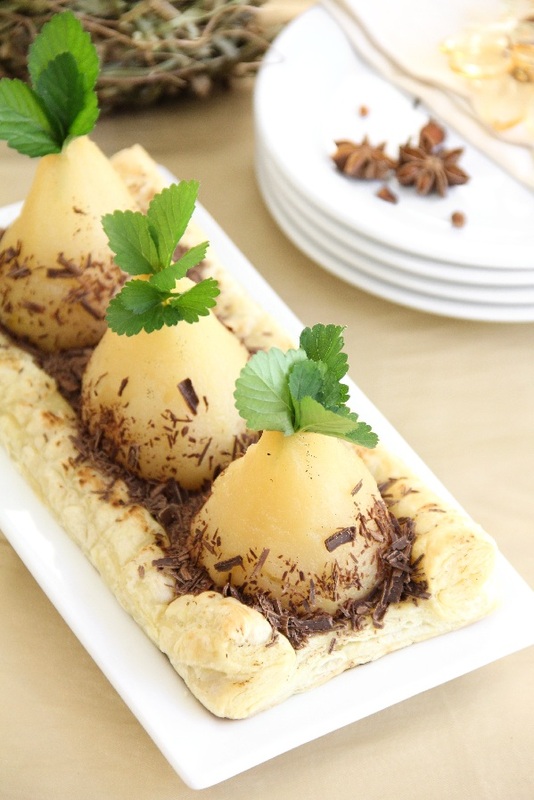 I love poached pears and I love chocolate so this tart has it all as far as I'm concerned. What a stunning tart... elegant and original! I'm glad I stopped by! Those are some of the most beautiful pears I have ever seen, Heather! What a gorgeous presentation! I will have to make a tranche one of these days. Thanks for sharing the technique:) Have a great weekend! Wow what a beautiful dish! And the recipe sounds super scrumptious! I will definitely have to try this, this fall. Oh that looks so fantastic. Beautiful and delicious. Love it! Heather, this looks amazing. The photos are lovely. I've just stumbled upon your site for the first time. I see I have lots of catching up to do. Heather, what a beautiful presentation!! Your mom sounds exactly like my mother-in-law, a master gardner. I've always enjoyed visiting her because her yard is always so impeccable and her flowers, gorgeous. I've had my moments, but fortunately, her son (my loving husband) has inherited her horticultural gene. Love these pears all tucked into their pastry beds. With chocolate shavings of course! Absolutely gorgeous; love the puff pastry tranche. Will have to use that idea soon! I am so not a gardener, but I can definitely see me wanting to make this on one of the cold Winter days soon to come. Beautiful photographs. Wow, what a beautiful dessert - I think I will also save the recipe for christmas! How elegant and yet so earthy for this fall season. Wow. This looks great. Thanks for posting this recipe. Its perfect for Christmas. What chocolate did you use? Plain? A peppermint one would work well. I am floored by this blog -- and I look at a lot of food blogs. You are so talented! So beautiful and perfectly Fall appropriate! Gorgeous! I love puff pastry. So easy but so elegant! Lovey dessert! Tried this recipe today, ive been poaching pears for years and couldnt wait to try a new way of serving them. Cored them and stuffed them with a delicate lemon curd and goat cheese creme which oozed amazingly when the pears were sliced. My only one problem is, was, that the bottom of the puff pastry came out doughy since the poached pears naturally retain moisture. Will try ths again by cooking the tart seppaate and adding the pears before presenting it unless of course you have a better idea.